This magnificent ring features a 7.02 carat Brilliant Round diamond of J color and SI2 clarity. 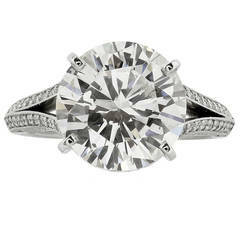 Lively and scintillating, this diamond ring is an unbelievably large look for the price point. The handmade, platinum mounting is set with 12 diamonds = 0.23 carat total weight for an added element of sparkle! Purchase includes ring box, complimentary ring sizing, and original GIA Certificate.